Mixer blades, Jiffy mixers, paint mixers. 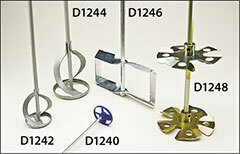 Additional mixers are available on the Drum mixers and 5 gallon pail mixers pages. Caution : Do not operate mixers unless blade is fully immersed in fluid. Consult with your material supplier and SDS to determine required eye, face, hand, and body protection when using these mixers. Purchaser assumes all responsibility for safety regulations concerning safe handling and mixing of hazardous liquids. Polished stainless steel 304, heavy-duty, efficient industrial mixers. Quickly and thoroughly mix dense viscous substances in open containers. Eliminate waste and unwanted aeration and cut mixing time up to 90%. Mixers equally effective with liquids, dry materials, liquid and dry materials combined or multiple component materials. Stress joints specially welded for extra strength. Uses two sets of specially welded blades. Vertical ones keep the mixing action between them and horizontal ones use exclusive hydraulic-flow principle that prevents sucking air. Horizontal blades also pull high density material up from bottom while forcing low viscosity solvents down from top. 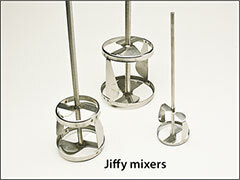 WARNING: Proposition 65 Label for Jiffy mixers . Mix paint, adhesive, and other viscous material. Use chuck size listed below.